The thick walls, the insulated crownboard and the sloping floor with its full-width entrance to deal with any condensation suggest that Delon's variant of the People's Hive hive would be better suited to cold climates than the latter. 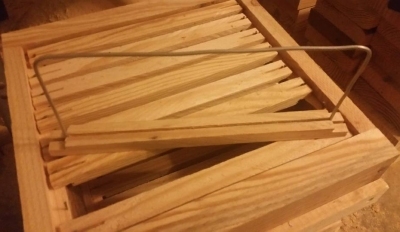 His use of frames that do not prevent the nest from being hermetically sealed at the top, or from being bridged in places to the sides of the box, yet can be removed easily because of the single length of stainless steel reinforcings rod embedded in the comb at the sides and bottom, may have special value in countries where state law requires combs to be easily removable for inspection, e.g. USA and Canada. 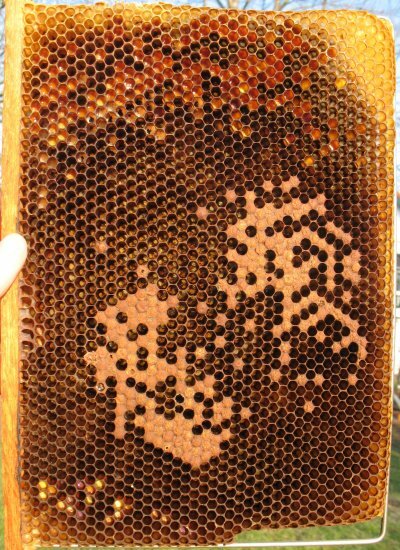 The following photo shows the frame wire embedded in comb on the right. Evidence of building past the wire is less clear in the following two photos from Stephen Bird (Germany) who has given Delon frames a thorough trial in eight colonies. 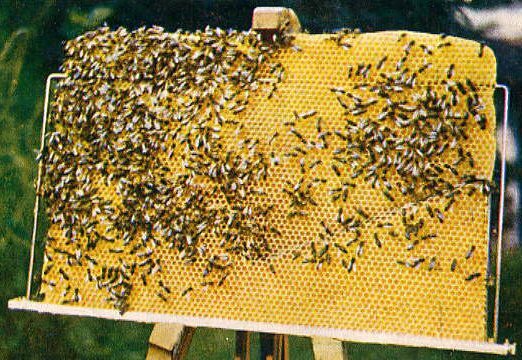 "The bees will integrate the wire into their wax comb. 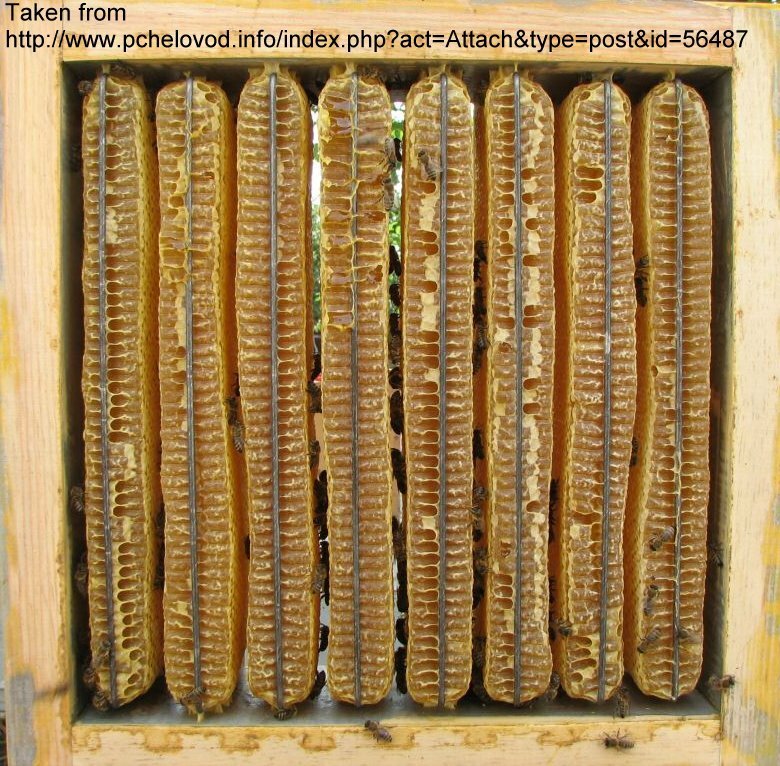 If you have bent your wire accurately they will attach the frame to the side of the hive body just under the top bars (3-4cms) just like a Warre. There are two photos of the Delon frame in the photo album "Stephen". Drilling accurate holes for the wire is difficult without a jig. Bending 3 mm stainless [steel] is easily done. The challenge is to do the drilling and bending without building in a twist, that [can become] a nightmare when you have a few frames bonded together with wax and reinforced with stainless [steel], and this totally defeats the object of the Delon frame. So, as stated, you need a bending jig and a drilling jig. It is also well worth the effort and expense of using a harder wood [for the top-bar]. All the holes and cuts produce quite a fragile frame when pine is used. I have had better luck with my Delon hives lately and have six out of eight overwintered at this stage. 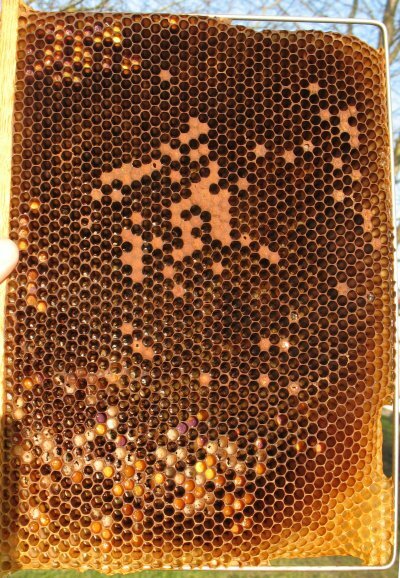 If you need to remove a Delon frame you still need to cut it out, which often goes into honey -- not great if robbing is a threat. 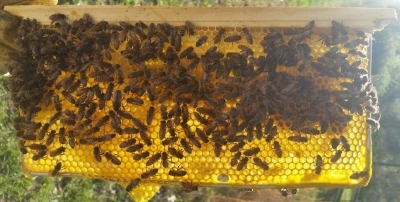 Once removed you can't lean it on a hive like a normal full wooden frame so one needs an empty hive body to put it in. 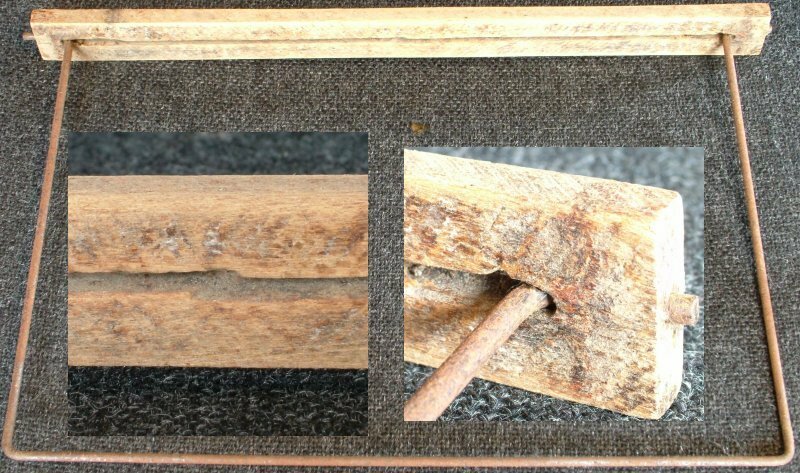 The frame is surprisingly strong when built out and even seems to be a little flexible compared to a full wooden frame. It is easily handled and one is able to hold it at any angle without fear of damaging the comb. Some type of system to space the frames needs to be used, pins or castellated spacers. 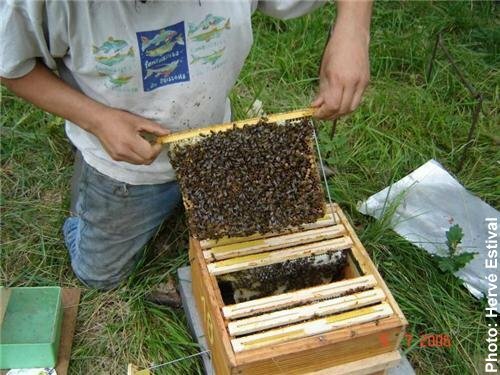 For a method of fixing the stainless steel wire to the top-bars, see: http://jacky.apiculture.free.fr/nouveaux%20cadres.htm . A Dadant 'growing down' or migrating into a Warré fitted with Delon frames and foundation. This process was started on 10 April 2008. 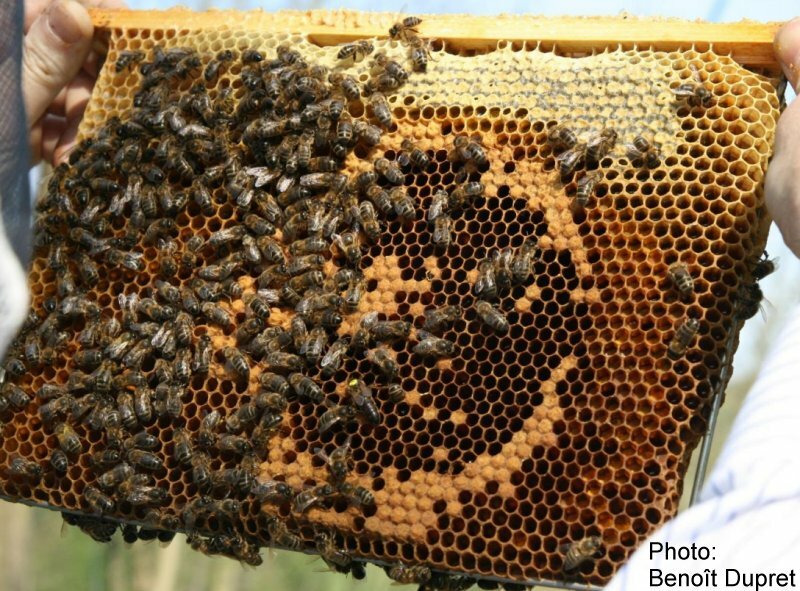 Two weeks later there were mature queen cells in the Dadant and the Warré. 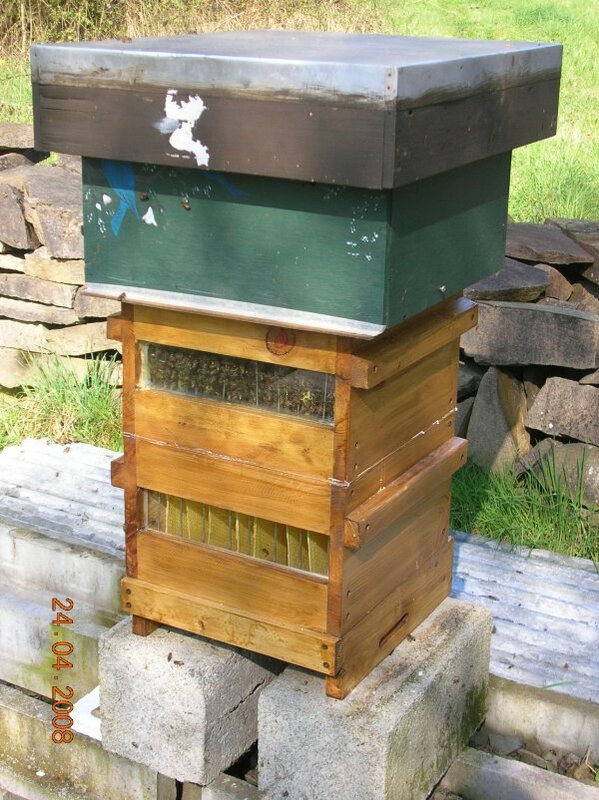 The unit was used to make four colonies: 2 Dadant, 2 Warré (photo: Benoît Dupret). 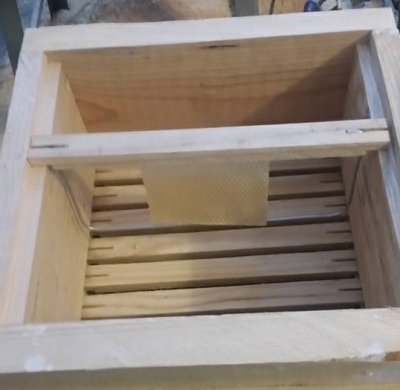 Slobodan Z. Jankovic (Serbia) has further developed the Delon version of the Warré into what he calls the 'Alpine Hive': http://pcela.rs/alpine_hive_1.htm. It has either Delon frames or wooden ones. Most of the information on this page is taken from Beekeeping For All (Warré) and La Climatstable de Roger Delon.htm (Delon).